Art Deco and life in Shanghai being two of my favorite topics, I could not miss the Art Deco design of new CITRON Café on Fumin Lu. I had noticed it while it was still under construction, so I could not stop visiting as soon as I could. 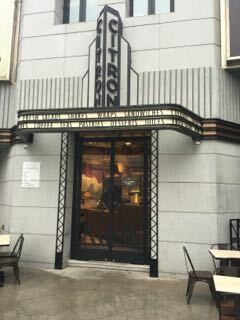 The façade of CITRON is very much inspired from Art Deco theaters in the USA, this was a real teaser for me. 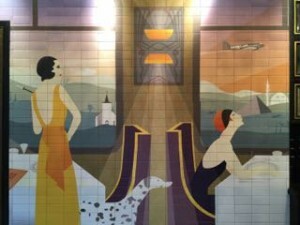 Designers have played with the Art Deco codes, giving the place a special feeling. 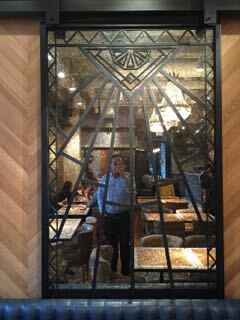 They have added many details, including a large mirror with wrought iron decor (see picture), brick wall (surely not the real wall but still nice) and a large wall painting that is very much 1920’s inspired. They even use Art Deco inspired cutlery, so there was some serious attention to details. The whole inside is themed after the 1930’s Orient Express train, so I am not exactly sure why the place is called Citron… but in Shanghai not everything can always be explained. This is a nice design effort, though a little bit of a patchwork. Being in an Art Deco city, I was also expecting some reference to Shanghai own Art Deco, particularly in a location in the former French Concession… but there is not such thing in Citron. Although still in soft opening, the food was simple but very well done. Particular note for the coffee that was really good. With a great central location, next to other famous establishments, I am sure they will attract many people. Add it a nice Art Deco theme and you can expect to find me there on a regular basis. This is the perfect place to prepare for the World Art Deco Congress in Shanghai in November. I live right down the street and can not even figure out where this Citron is! I thought I knew all four corners of Fumin and Changle, like the triangular park, etc. — but obviously I’ve missed one. Thanks for alerting me. I will go there tomorrow and see where this place is. Must have really been under wraps for me to miss it!